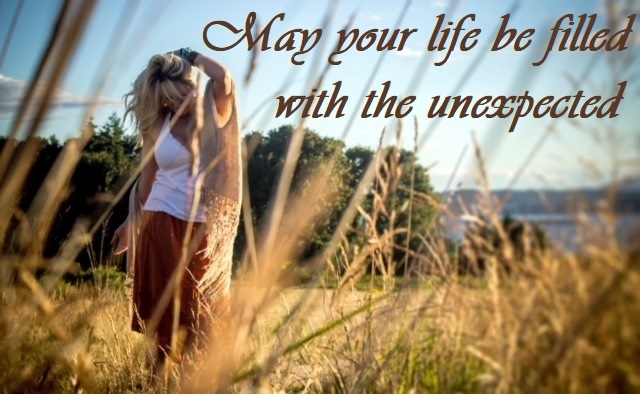 May your life be filled with the unexpected! HABIT is so sticky. Like a spiders web you can easily get caught up in it! At first it feels good because finally everything has settled down and you know what to expect but, what you didn’t know is, expectations are your worst enemy. And once they have you it is really hard to get away. expectations are born of attachments and attachments are the root of all suffering. The only way out is to shake things up and free yourself from the trap of expectations! Start with noticing them! Notice when you shift into auto pilot and are just going through the motions of your life. Then just notice if you can look at the same things, hold the same yoga poses, go to the same places but, see them differently. You are going to have to view HABIT as the enemy! I struggle with the same boundaries of habit as everyone else. I get it! How do you live in the same house, with the same people, go to the same job and still expect the unexpected? I had a yoga practitioner say to me at the end of class “That was so unexpected.” I felt like I had won the lottery. Not, only was the class unexpected but she had loved it and found grace in the unexpected. This is truly the goal of yoga to break the chains of homeostasis. To literally rock the boat that the subconscious resides in and hopefully give the conscious mind back the reigns of your life for just a moment. HABIT is our worst enemy! It can hide in your thoughts, words and actions and you will be begging to reveal something else as your life but HABIT keeps you stuck in the groove everyday becomes a whirlwind of habits until your life is just flying past your eyes and you feel like you are no longer even part of it. Yogis call this Samskara and those grooves in our psyche are deciding our destiny. Just outside your HABITS, miracles, Freedom, joy, bliss, happiness and unconditional love reside! ← What is trying to leave your Life?